Patrick Makau broke Paul Kosgei's 2006 course record by 11 seconds in running the fourth fastest time ever, and pulling two others under the hour. Benita Johnson won the women's title in 68:47 with Irina Mikitenko of the German club TV Wattenscheid second in 69:46. The event organisers SCC-RUNNING recorded a total of 22,048 participants from 70 countries, watched by 150,000 spectators along the route in warm but overall good conditions. A year ago 20,419 took part. 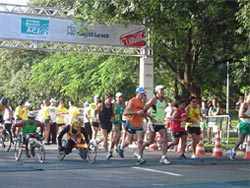 The figure consisted of 18,531 runners in the half-marathon, 1,711 inline skaters, 22 handbikers and nine wheelchair competitors. In addition there were 747 runners on the start line for the 3.5 km Vattenfall FUN-RUN, 401 for Nordic Walking over 6.8 km as well as 536 children in the Bambini Run and 91 in the Kids Cup. There were 2,016 runners from abroad taking part. The lead group went through the first 10km in 27:27, but the winner, Patrick Makau, reflected: "We had the wind at our backs for the first ten kilometres and that helped us but the wind gave us problems after that." Benita Johnson won the women's race in emphatic style. She said: "It was hard running alone for much of the race and the wind also made things tough. But now I've run the Berlin course, I know how fast it is." Behind her two German runners completed the podium places. Behind Irina Mikitenko it was a surprise to see another German athlete on the podium: 2005 winner Luminita Zaituc. She overtook the defending champion and course record holder Edith Masai of Kenya (67:16 in 2006) shortly before the finish. Masai ran the first seven kilometres alongside Benita Johnson but could not sustain her pace. Victor Rothlin's remarkably even-paced run (64:08/64:09) won him the race by more than a kilometre, beating the old course record by 96 seconds. Four pacemakers, and cool, clear weather conditions assisted in establishing a new Swiss national record. After a cool (2°C) start at 8:30 am, the sun soon helped to warm up the athletes as they ran beside the lake. Beautiful spring weather gave a festive atmosphere to the day. Thousands enjoyed the sun and relaxed after the race in the lakeside finish area at Landiwiese. Music bands entertained the masses along the route, and Nike sponsored a special entertainment point at 35km to motivate runners for the final push. Thousands of spectators cheered Röthlin on and this, along with the improved, flatter, course through downtown Zurich certainly helped in achieving the new record. Only 214 of the 4860 starters failed to finish within the five-hour time limit. They represented 49 countries, with 565 runners from Germany and 63 from Great Britain, 58 from Austria, 37 from Italy, 36 from France and 34 from the USA. 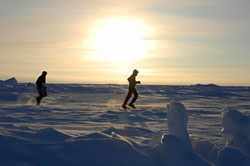 Forty-three runners from 22 nations took part in the race recognised as the world's most northerly marathon, run entirely on the frozen water of the Arctic Ocean. Participants flew from Spitsbergen in Norway to a drifting Russian ice base in the high Arctic Ocean, where a 4.2 km course was prepared. 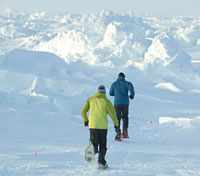 Contestants had to run 10 laps of the circuit at the Geographic North Pole, passing through spectacular ice hillocks and vast ice floes. The race got under way at 02.45 GMT but with continuous daylight at this time of year runners enjoyed brilliant sunshine, which took the edge off the minus 25°C temperature — although they still needed three layers of clothes to cope with the frigid conditions. Thomas Maguire finished in record time, shunning the heated refreshment tents along the way, Maguire — who finished 12th in the 2006 World 100km Championships in Korea — chose to complete his epic run without stopping for food or water. He won a Kobold expedition watch for his efforts. Francesco Galanzino finished seven minutes behind Maguire. Susan Holliday won the women's race almost 18 minutes ahead of compatriot Katy Disley, but perhaps the most amazing achievement was that of Paralympic athlete William Tan. He used the specially-prepared flat runway section of the course to complete a marathon in a wheelchair, covering his particular circuit in just over 21 hours. Tan, from Singapore, is attempting to complete marathons on all seven continents. As he sat in his wheelchair at the precise Geographic North Pole, Tan declared it to be the happiest day of his life. Given that it was not possible to freewheel at all on the icy surface Tan's efforts were truly remarkable. Mubarak Hassan Shami of Qatar and Ethiopian Magarsa Assale Tafa were the clear winners of the 31st edition of the Paris Marathon writes Pierre Jean Vazel. No less than 35,000 participants ran in warm conditions with Shami recording a world leading mark of 2:07:19 to win by more than two minutes. Tafa took the women's race by more than three minutes. The pacemakers took the race out fast and a compact group emerged, including Shami, Spanish Record Holder Julio Rey and Ethiopians Gashaw Melese (the 2006 winner), Deriba Merga (Marathon debutante) and Tariku Jifar. During the first half, Melese and Rey had difficulties staying with the pack, often running a few metres behind. Race organisers urged the pacemakers to slow down after they reached the half way point in 1:02:50, 14 seconds faster than Paul Tergat's pace during his World record run of 2:04:55 three years ago. Rey and Jifar were the first of the leaders to drop. After 25km Shami surged away, immediately followed by inexperienced Merga. For a while, both men helped each other to prevent an eventual comeback from Melese. As the temperature rose along the banks of the Seine, the runners' speed dropped just before just before 30km. Shami then produced a second acceleration to which Merga could not respond. Hedropped back to eventually finish 11th overall. 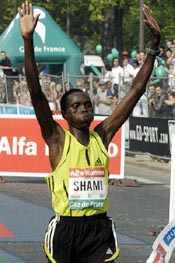 Shami's lead was never challenged, and he entered the Avenue Foch alone to win by two minutes, 34 seconds over Melese. Paris was Shami's fifth Marathon, and he remains unbeaten since his 2005 debut victory in Vienna (2:12:20), which was followed by wins in Venice (2:09:22, 2005) and in Prague (2:11:11) and the Asian Games (2:12:44) last year. The women's race also started fast with the Ethiopians Asha Gigi and Magarsa Tafa striding away to lead by 30 seconds at 5km. They reached halfway in 1:10:12, while just before 30km, Frenchwoman Zahia Dahmani was a distant third some two minutes behind. Gigi, like Merga in the men's race, was weakening and eventually finished fourth. Coming from behind, Russian Gulnara Vygovskaya and Christelle Dauney of France were some four-and-a-half minutes behind Tafa, and three minutes behind Gigi at the 35km. They caught Gigi, but the 23-year-old Tafa sailed to a clear victory, smashing personal best by two minutes, 50 seconds. Vygovskaya made a huge improvement in her personal best while Dauney, in her debut marathon, became the third fastest Frenchwoman ever. Runners came from 87 countries. 72% were French, about 3000 came from Great Britain, 1000 from Italy and 450 from Brazil. The 31st edition was the Mag and Mag show — with 2005 winner Magnus Michelsson scoring his second win and Magda Karamali-Poulos winning the women's race in a personal best. Karamali-Poulos was a clear winner but Michelsson had to fight in the latter stages to hold off debut runner Anthony Haber. 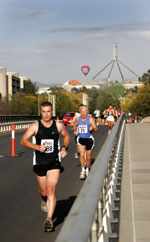 The Canberra Marathon also incorporates a 50km option and this race was again the Australian 50km Road Championships. Both winners secured trips to the IAU World 50km Final in Palermo, Sicily, in October. Third woman in the 50km was Tina Torpy, who improved her own W60 world record (pending approval by World Masters Athletics) by eight minutes, recording 4.13.32. She had set her previous record in Canberra last year. Tina also broke the W60 race record for the marathon distance, clocking 3.30.19 on her way to 50km. 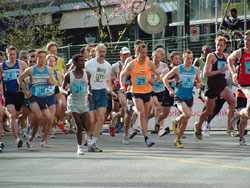 The marathon attracted over 1000 marathon runners for the first time since 1985 and the 941 finishers was the most in the event's 31-year history, with the exception of the 1984 Olympic Marathon Trial which attracted a record 2400 participants. Associated events — Kids Marathon and Asics Marathon Eve 5km and 10km Fun Runs — bolstered the entrants to over 2000. Over 80% of marathon runners were visitors to the Australian national capital. Aniko Kalovics notched up her second Italian victory, ducking under 2:30 on a warm and sunny day writes Diego Sampaolo. The temperature, rising to 23°C, did slow the final times. Kenya took the top three spots in the men's race as Philemon Tarbei won his debut marathon. Italian favourite Daniele Caimmi came fourth in his comeback race. Jackson Kirwa, as pacemaker, led a seven-man group through halfway in 1:04:22. Caimmi went to the front after 26km as the course entered the Valentino Park, the green area of Turin. He repeatedly attacked but could not drop the Kenyan trio on his heels. At 30km, Caimmi and Tarbei ran in front, passing in 1:32:29, followed by Yusuf Songoka and Hillary Bett. Caimmi's front running tactics, up to 36km, proved his undoing. "I am disappointed because I had to run as the pacemaker and the Kenyans never helped" he said afterwards. Songoka attacked at 37km, as Caimmi dropped to fourth place, now trailing both Tarbei and Bett. But he closed the gap on the Kenyan trio in the following kilometre and briefly contended for the win until Tarbei launched his decisive attack. 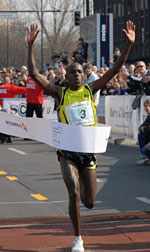 The Kenyan secured his first Marathon victory and the eighth Kenyan triumph in the history of the Turin race. "It was very hard today because the pacemakers did not do a good job," said Tarbei. "I congratulate Caimmi who ran a good race. Considering that it was my first Marathon ever, it was a good race." Aniko Kalovics front-ran from the start, paced by her fiancé and coach Zsolt Zsoder. She set a 2:26 pace in the early stages, hoping to better her unofficial Hungarian record of 2:26:43 set in Carpi last autumn (on a non-standard course). She built a gap of 1:31 over Caroline Kwambai to reach the halfway mark in 1:13:15. But the warm day took its toll on her. She slowed in the second half although her victory was never threatened. She increased her gap on Kwambai to five minutes in the final kilometres. The race was run on a new course from Via Po to Piazza Castello in the heart of the city which hosted the 2006 Winter Olympic Games last February, and attracted a lot of enthusiastic spectators. 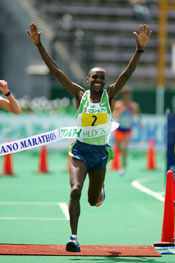 Defending champion Nephat Kinyanjui of Kenya won the ninth annual Nagano Marathon writes Ken Nakamura. Kinyanjui outsprinted Georgiy Andreyev to become the first man to successfully defend the title. Andreyev, who was credited with the same time, repeated his position of last year. After a slow start Shinichi Watanabe picked up the pace around 6km, and led a group of 16 through 10km in 31:21. Toshinari Takaoka, who was 15 seconds behind at 10km, had caught the leaders at 15km (47:36). The lead pack was reduced to ten runners at 20km, and eight remained at 30km. With one kilometer to go Kinyanjui, Norio Kimijyo and Andreyev were left: Kimijyo fell back as the trio entered the Olympic Stadium while Kinyanjui, for the second consecutive year, outkicked Andreyev over the final 200m. Women's winner Alevtina Ivanova, who finished second in this race in 2003 and fourth in 2004, had a much easier time. The lead pack as much smaller — just six runners after 5km (17:28). Romanian Lidia Simon lost contact soon after halfway, leaving just Ivanova, Dire Tune and Lyubov Morgunova in contention. Ivanova made her decisive move at 37km and quickly built an insurmountable lead. Weather conditions were good (13°C, humidity 50%). 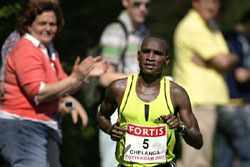 In temperatures of up to 25°C Joshua Chelanga won the 27th edition with a very impressive time, two minutes clear of his opposition writes Wim Van Hemert. Hiromi Ominami's winning time was also impressive, but due to the heat and very sunny conditions, the organisers decided to stop the race after 3.5 hours to protect runners against possible health problems. Behind Ominami the very hot conditions were simply too much for most of the runners although it was the strongest field ever assembled in Rotterdam, with fifteen men with a personal best below 2:09:00. A large group set off at a fast pace - 10km was reached in 29:58 - before the heat began to take its toll. In the southern part of the city, there was no shadow and barely any wind. From 20°C at the start, the temperature quickly rose to 25°C. A lead group of 14 passed halfway in 1:03:54 - only 24 seconds down on the intended schedule. After passing the Erasmus bridge, towards the northern part of the city, the group broke up. At 30km (1:30:29) Chelanga, Takayuki Matsumiya and Solomon Bushendich with Patrick Ivuti and Elijah Mutai about ten seconds behind them. Chelanga went ahead in the Kralingse Bos at around 32km and reached 35km alone in 1:45:43. Chelanga was a late entrant but made a very strong impression. "Under less hot conditions I think I could have run in the 2:06 range" he said. Runner-up Matsumiya was very happy to break his personal best by 18 seconds. Hiromi Ominami was happy with her overwhelming victory. "First I have to thank my pacemakers," she said. "They did a wonderful job. The spectators were magnificent, always encouraging me. Next year I will come back with my twin sister Takami, who won here in 2002." Luc Krotwaar, in tenth place, captured his seventh national marathon title. Nadja Wijenberg took the Dutch title with her sixth place in the women's race. More than 10,000 runners took part, but beyond the numbers there was an incredible atmosphere with great streetside support. The main objective was not just participant numbers, but to attract young people into the sport, and this effort will be redoubled next year. Corpore president David Cyntrynowicz said: "Today's idea will be taken forward into our future events. We aim to preserve our physical and social environments through events like these." This 8th edition of the race was the first to offer monetary rewards to all categories, including young runners and wheelchair categories. "It was a victory for everyone" said Fernando Aranha Rocha, who won the wheelchair event in 1:00:07. People came to run from all over the country. The race organisers provided accommodation for many competitors, which was greatly appreciated. Erinelda da Silva was the only female wheelchair competitor, and it was her first visit to Sao Paulo. She dedicated the occasion to her two children - even though she had hoped for a better time. The wheelchair race set off at 07.40, together with the female elite. The elite men and the mass race followed at 08.00. Runners set a fast pace from the start. 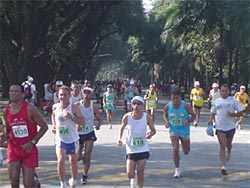 The eventual winner, Franck Caldeira, who also won in 2003, 2004 and 2005, forced the pace between 14-15km and took a commanding lead, sufficient to secure him his fourth victory. "This was a fast training run" he claimed at the finish, "because next week I will run in the Sant Antonio Marathon in Padua (ITA)". Even so, it was his fastest time in this race. "If it wasn't for the coming marathon I would have gone after the course record" he said. Among the women Marcia Narloch, who had been third in 2005, gave no chance to anyone. Strong from the start, Narloch front-ran to victory by a margin of 90 seconds. Priscah Jeptoo, running this event for the first time, took second place. Prize money was awarded to the top 10 men and women, to a total value of R$ 27mil. Age categories are another important aspect to the race. "Prize money is important" said Maria de Fatima Pessoa de Souza, winner in the 50-54 age group. A regular placer in the Corpore rankings, she travels from Rio de Janeiro to compete. "I got here today at 04.30. I come here from Rio because the organisation is superlative - they respect us runners." she said. She arrived by bus with 47 others from Rio de Janeiro. The only octagenarian runner, Joao Rosario, was also emotional at the award ceremony. "Each time I mount the podium I give thanks" he said - although he was using the event as preparation for a marathon. A 6km fun run was also held in conjunction with the main event. Cold, rain, and high winds made the 111th Boston Marathon the slowest in more than 20 years. Lidiya Grigoryeva and Robert Chepchumba's winning times were the slowest since 1985, when Boston was still caught between its amateur ethic and the realities of modern day sport. The women's event incorporated the US trials for the IAAF World Championships, and Deena Kastor was a favourite for both the trials and the open race. It was 11°C at the start - much milder than most forecasts, but the rain beat down and most competitors were dressed defensively. After 5km a pack of eight, mainly led by Jelena Prokopcuka, had got 40 seconds clear (17:12). Little changed through 10km (34:50) and 15km (53:35) except that the pace slackened. Defending champion Rita Jeptoo tried to get away at 18km but was reeled back in and the sedate pace continued through halfway (1:17:10). Then things started to happen. Prokopcuka took her gloves off, Jeptoo shed her long-sleeved shirt and they took a group of six away, as Volpato and, surprisingly, Kastor fell behind. Through 25km Prokopcuka continued to push but the pace had improved only marginally. Lidya Grigoryeva was now her pacing partner as they ran alongside Madai Perez and a little ahead of Rita Jeptoo. Jeptoo lost 20 seconds to this trio by 30km (1:47:37). 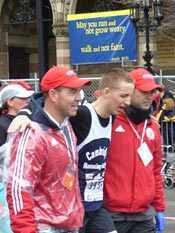 The three of them matched each other stride for stride up Heartbreak Hill. Only at 40km was the decisive move made - by Grigoryeva. Within the blink of an eye she gained a decisive lead, pursued by the dogged Prokopcuka and the diminutive Perez. Deena Kastor at least took the US trials title, followed by Anne Alyanak, Kristin Price and Mary Akor. The men's race, heading the mass field, set off 25 minutes after the elite women. Race favouriote was Robert Cheruiyot, who had won Boston and Chicago last year but had fallen as he crossed the finish line in Chicago, banged his head on the ground, and was treated for internal bleeding. He reported that his training had gone well in building up to Boston his yar, but complained of headaches and said: "I cannot say that I am 100%, but I will give it my all." Two runners flew off the front. Josephat Ongeri and Jared Nyambok stayed significantly ahead of the field thrugh 5km, 10km, 15km - and at halfway had a lead of 95 seconds (but already diminishing from their maximum advantage of 2:04 at around 13km). Only at 25km did the tactically hidebound pack sight the two leaders and their pace seemed to perk up in response, but was still slow enough for 20 runners to sustain it. Through Heartbreak Hill attrition finally set in. At 35km Robert Cheruiyot headed a group of six - and only 2km later he had only James Kwambai to contend with. Cheruiyot now had no headaches. He surged strongly to drop Kwambai with 1500m to go, and claim his third victory in Boston. Home favourite Olivera Jevtic won the 20th edition of the race after running more than half the distance with an obvious ankle injury, writes Pat Butcher. She took the lead right from the start, and was going well through the first 10km but as the ankle injury started to show she slowed to accommodate it. Jevtic, who is the only Serbian athlete already selected for the Beijing Olympics in a year's time, said, "I had a pain in my left leg for the last 15 days, it was caused by the change in climate. I've been training in Kenya, and when I returned to Serbia, it was colder, and that brought it on. I had pain all the time, from the very start. I thought about dropping out, but I just could not, because of the wonderful support I was getting; the fans were with me all the way." In the men's race John Maluni only got away from Nicholas Chelimo in the last 100m, to win by three seconds. Both runners posted personal bests. Maluni, trained by three-time Boston winner Cosmas Ndeti, said, "At 35km I thought I could win. The weather was perfect (16°C)." Runner-up Chelimo is coached by world record holder Paul Tergat. The finish tape was held by world record long jumpers, Bob Beamon and Mike Powell, who were the marathon's celebrity guests. Luke Kibet battled rising temperatures to win the biggest victory of his career to date. Luminita Talpos had a convincing win in the women's race from an improving Martha Markos, who knocked almost five minutes off her personal best. Susanne Pumper's third place gave the home crowd something to celebrate. 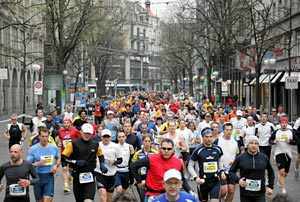 A record 26,279 runners from 80 nations took part, including the shorter races supporting the main marathon event. The leading men passed halfway slower than planned, in 65:37. "It was getting too warm, and we were watching each other", Kibet later explained. The race favourite Bernard Barmasai lost ground after 24km. The former steeplechase world record holder (who is still third fastest of all time with his 7:55.72 from 10 years ago) was hoping for his first marathon victory, but he dropped out at 35km. Kibet shook off his last challenger, Abel Kirui, at 37km. Luminita Talpos was never challenged on the way to her first marathon victory. The 34 year-old passed half way in 1:14:23, more than a minute ahead of Martha Markos. "I am happy to have finally won a big marathon, though I did not quite get the time I wanted" she said. She will now prepare for the World Championships marathon in Osaka. After dropping out in Rotterdam and failing to get into London, it was third time lucky for Rogers Rop as he won the Hamburg Marathon from his compatriot Wilfred Kigen by a single second writes Jorg Wenig. 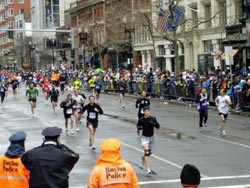 The 31-year-old winner had won both the Boston and New York Marathons in 2002, but here he set a new personal best by two seconds. Ethiopian Ayelech Worku won the women's race by a slightly bigger margin from Rose Nyangancha. Weather conditions were almost ideal at 15°C, but there was some wind. 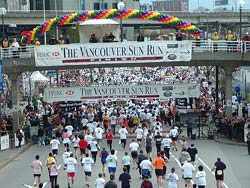 A total of 23,027 runners registered for the race. Pacemakers guided the favourites through the first half in 1:03:20. Samuel Muturi, running his debut, and Rop then broke away. They were followed by a group of four, including Kigen and Kiprotich Kinei. Rop decisively broke away at 35km but Muturi struggled over the final 7km and finished a distant 12th in 2:12:46. With 3km to go Rop looked fully in control with a lead of 34 seconds. 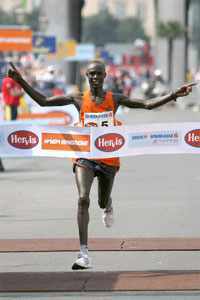 Behind him Kigen and Kinei picked up the pace and Kigen, the two-time winner of the Frankfurt Marathon, closed the gap. In a dramatic finish he overtook a tiring Rop, but did not expect Rop to produce a counter attack in the last few metres. At the finish line Rop was one second ahead of Kigen, who also produced a personal best. "I intended to break my personal best, so I pushed the pace from the beginning" said Rop. "In the end my energy was fading, but I won." In the women's race Lithuania's Zivile Balciunaite passed the halfway point in 1:12:54. She was ahead of a chasing group by more than a minute but then began to fade. Worku, Nyangacha and Beatrice Omwanza first dropped the 2005 winner Edith Masai and the trio went on to catch and overtake Balciunaite after 35km. Worku proved strongest in the closing stages. "Only when I passed 40km, did I know that I had a chance of taking the race" she said.